After using my Ender 3 for some time, and after reading the_digital_dentist's blog series on the UMMD, I've decided to start my own project for a printer that has, atleast, a 500x500 build area. that my belts are parallel. I'm planning on using GT2 9mm belts, 20-teeth GT2 pulleys, F608zz and F6902ZZ bearings as idlers. It's been atleast 15years since I touched any CAD software or did any mechanical engineering, and my math is... Let's just say it ain't my day job! My guess is that for the belt to run parallel between a GT2 pulley and an idler, the top of the pulley teeth should be in-line/parallel to the surface of the idler? 1.2 mm apart if I understood you question correctly. Belt is 1.2mm thick. Rereading my question, I see that I see that the actual question isn't really obvious. That's what you get for posting late at night! You seem to have caught the gist of my question. If the belt is 1.2 mm thick, the surface of the smooth idler would have to be 1.2 mm from the bottom (and not the top of the teeth) of the pulley teeth, right? Had another go at it today, and the attached PNG is what, somehow, makes sense in my head. 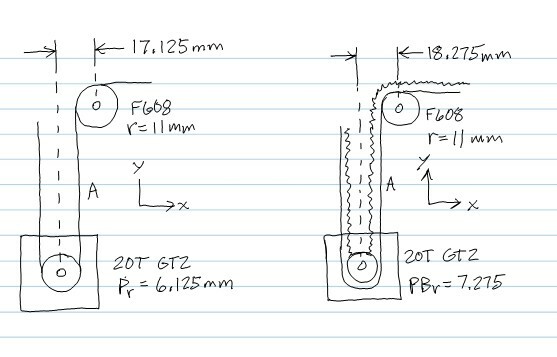 For reference, I used table 12 on page 17 here to get the PD (12.73) and the OD (12.22) of a 20T GT2 pulley, and the tech drawing here for the belt dimensions. the same time, the outside diameter of the pulley will be in contact with the bottom of the belt tooth. Also, the idler's I'm referring to consists of 2 F608ZZ bearings with a OD of 22. Given that data, my assumptions is that if the belts teeth needs to be in contact with the idler, and stay perpendicular, the idler center would have to be 5.64 mm below the pulley (Which is the rightmost circle on my drawing). If the belts back would need to be in contact with the idler, the center of the idler would have to be 17.74 mm above the pulley (Which is the leftmost circle on my drawing). Pitch diameter is where the cords run inside the belt, not where the back of the belt will be. The back of the belt is the reference for checking parallelism with the guide rails because the back of the belt, not the cords in the belt's core, will be riding on one of the pulleys. If you're using the same layout I used in UMMD, the only place where this matters is in positioning the motor mounts in the X direction to ensure that belt segments A and G are parallel to the Y axis guide rails. All the rest of the pulleys' axles can simply be positioned along lines parallel to the guide rails and the belts will end up parallel to the rails between those pulleys. Edited 2 time(s). Last edit at 12/16/2018 07:00AM by the_digital_dentist. That makes sense (Had to make a small ad-hoc CAD drawing to verify it, but it seems to work) - Though that formula only works when the belt is oriented so that the back is in contact with the idler, I'll see if I can't figure out the formula for when the belt is oriented so that the teeth is in contact with the idler. Edited 1 time(s). Last edit at 12/16/2018 01:56PM by MadsRC. Using a 2mm GT2 belt and a 20T pulley? That GT2 belt should be 1.38mm thick, 0.75 of those "lost" to the teeth of the pulley, leaving 0.63 mm - A 20T pulley having a diameter of 12.22 and adding the 0.63 from the belt should give you a total diameter of 12.85 - Or am I missing something... If we change the 20T pulley for a 21T pulley, your numbers match, so that might be it? I am measuring outer diameter of pulley with belt making it "actual" measurement not a "theoretical" calculation . 13.5mm is actual outer diameter of my 20 teeth motor pulley with 10mm gt2 belt on a live 3d printer. Thank you to the both of you, I think I might have figured it out. Now, all I need to do is draw it and I'll try to order some parts for it!